Property Location Located in Newport, The Spring Seasons Inn is minutes from Touro Synagogue and Jane Pickens Theater. 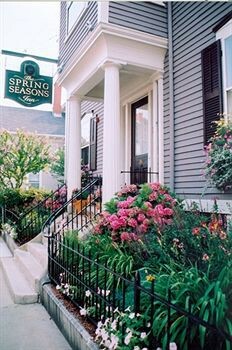 This bed & breakfast is within close proximity of Old Colony House and Trinity Church.Rooms Make yourself at home in one of the 3 air-conditioned rooms featuring refrigerators and iPod docking stations. Cable programming and DVD players are provided for your entertainment, while complimentary wireless Internet access keeps you connected. Private bathrooms have jetted bathtubs and complimentary toiletries.Rec, Spa, Premium Amenities Make use of convenient amenities such as complimentary wireless Internet access, a fireplace in the lobby, and tour/ticket assistance.Dining A complimentary full breakfast is served daily.